Financial woes have plagued Wixo LPR Piacneza for years. 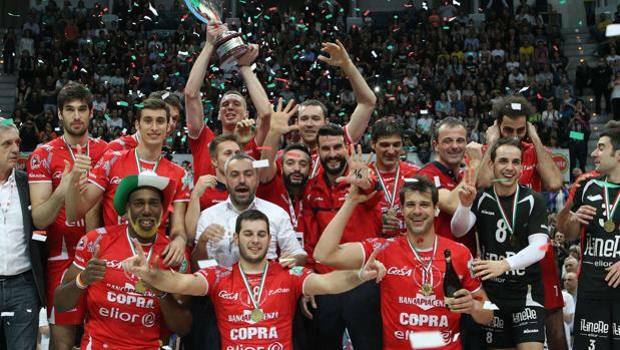 After the 2014 season there was a worry that they would not be able to compete in the top flight of Italian volleyball. This was a club that won the CEV Challenge Cup and was just 3 points away from winning the Italian Serie A1 title against Trentino in 2013. In 2014 they won the Coppa Italy and reached the semifinals of the playoffs. Their roster was full of some of the most valued volleyball players in the world today. The problem faced by Piacenza was that high-profile players cost a great deal to keep on your team. Max Holt left for Dynamo Moscow after the 2013 season. The conclusion of the 2014 season saw the exodus of many key players, and some of them ended up at Piacenza’s top Italian rivals. Luciano DeCecco signed with Perugia. Luca Vettori wound up with Modena. Alessandro Fei made the move to Lube Civitanova. Robertlandy Simon went to Korea where they moved him from middle blocker to opposite. Kevin LeRoux found himself as the starting opposite in the fall of 2014, but left for Korea after just a few matches. Their performances suffered with the loss of so much talent. Hristo Zlatanov and Samuelle Papi remained with Piacenza, but they could not carry the team without a supporting cast. While both of those outside hitters are accomplished, Zlatanov was 38 and Papi was 41. Piacenza finished the regular season in 9th place and missed the playoffs. They advanced to the playoffs of the Champions League, but that was mainly due to such an easy group. Their group consisted of Tomis Constanta of Romania, Knack Roeselare of Belgium and #Dragons Lugano from Switzerland. Even with the easiest group in the competition, they finished behind Tomis Constanta and lost in the Playoffs 12 round. Jumping ahead to the summer of 2018, Piacenza has not placed higher than 6th in the league, and they have not won a single playoff match. Each summer has been a struggle to obtain the funding in order to compete the next season. This summer is a bit different as their president, Roberto Pighi, found himself without enough corporate sponsorship money to operate the club and put a competitive team on the court. He invited many potential sponsors and local politicians to a meeting in order to plea for their financial support. Only three potential sponsors showed up, and it seemed certain that that the SuperLega was not in the club’s future. Pighi was criticized in the local media for his inability to keep the club afloat. He wrote a letter that was published on June 27th where he explained he had been able to put in 3,000,000 Euros into the club. There was another commitment of 500,000 Euros out of his own pocket for the upcoming season, but that was still not enough. The club still has to deal with past debts that Pighi inherited when he came to Piacenza. While the SuperLega was not a possibility, there was the issue of Serie A2. Pighi had given no definite answer when asked if the club would be participating in the second tier of Italian volleyball. The Italian website, gazzetta.it, announced on June 30th that Piacenza will be registering for A2 this upcoming season.